The scenery of the upper Jacks Fork River is stunning anytime of year. 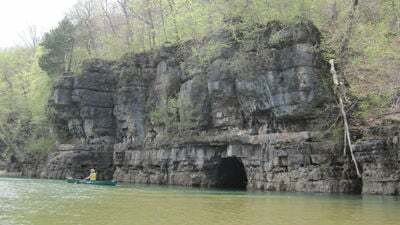 The bluffs along the Jacks Fork are a big part of its attraction. Turtles bask in the sun on a log. I’ve been floating the Jacks Fork every summer for longer than I care to admit, but only once was I there when the water was high enough to put in at Buck Hollow and float the upper stretch that passes Jam Up Cave. So when the opportunity came recently to float from The Prongs to Buck Hollow and then on to Rymers, I jumped at it. Well, actually, it was more of a stop-and-start process. With all the spring raining and flooding, the trip was on again, off again, until we grabbed a few sunny days between a flash flood and more rain. The river gods were smiling upon us, with blue sky, warm sun and the rosy hue of redbuds just starting to bloom. Our small flotilla of canoes – both tandem and solo – and one kayak set off from the South Prong access at the Highway Y bridge, northwest of Mountain View. As soon as we rounded the corner, the first challenge came into view – the big culverts we needed to pass through. One was blocked by a rootwad, undoubtedly a result of the recent flash flood, so we sailed through the only open option. Looking back after we passed through, we could see the culverts for the North Prong; the two branches of the river join at this point. 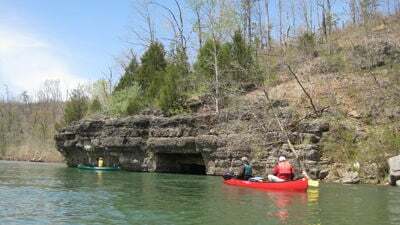 The upper 25 miles of the Jacks Fork are truly beautiful, with a canyon-like feeling because of the narrow riverbed and the towering limestone bluffs, often on both sides of the river. The section from the Prongs to Buck Hollow (Highway 17 bridge) is 6.8 miles, which made for a leisurely day’s float. Leaves were just beginning to unfold, giving trees a spring-green halo. The pink of redbuds and the white of dogwoods popped up along the bluffs and through the woods. The water was crystal clear and deep, and the river banks were carpeted with Virginia bluebells. Turtles basked in the sun on logs and rocks. We spotted osprey, bald eagles and a night heron. There were two other groups floating and fishing this section of the river that day, and we leap-frogged one another, as some stopped for breaks or to cast a line and others paddled on. The one constant companion the entire day was a young dog who swam tirelessly back and forth across the river and trotted alongside on gravel bars. She would join one group, then another, and we all thought that she was with one of the other boats. Gradually we realized that she was not with any of us, but was on her own on the river. Because she seemed like she knew her way around, most thought she would go home on her own. But when we arrived at Buck Hollow that afternoon and she was still with us, seven miles from where we had started, I checked her tags for numbers and began making calls. Her owner was relieved to learn where her 14-month-old Lab-Shepherd mix was and immediately drove to Buck Hollow to pick her up. “She’s definitely a river dog,” she said with a laugh. Some of the group headed home that day, but a couple of us spent another night at the primitive campground at Rymers, listening to the whippoorwills, owls and frogs while we sat beside a campfire under a starry sky and almost-full moon. The next day we put in at Buck Hollow and headed for Rymers, a 9.4-mile trip. My goal was to find the natural arch in the Jacks Fork Natural Area that had been featured in the April 2013 issue of Missouri Conservationist. Soon we spotted Jam Up Cave on the bluff ahead, which meant we had passed the arch without spying it. Jam Up Cave, between Blue Spring and Rymers, is one of the most spectacular geological sites in the state. The main entrance, high on the cliff but visible through the trees from the river, is an arch about 80 feet high and 100 feet wide. The cave is now closed to visitors because of White Nose Syndrome, a disease that harms bats. But when I visited the cave years ago, it was possible to hike into the cavern, scramble over big boulders and see the underground waterfall and pool. Some people even swam in the cold cave water, but I was too chicken to do that. The cave is actually a natural tunnel, and includes a sinkhole, dome and various passageways; access varies with water level, which changes within the cave. After lunch on the gravel bar across from the cave, we had just rounded a bend when we came upon two canoers waving in distress. They had flipped their heavily loaded canoe in the rapids and one had cut his hand to the bone. With a solo kayak and a solo canoe, we couldn’t give the injured guy a ride, but we helped as well as we could, then went ahead to Rymers to drive to the top of the hill and try to get a cell phone signal to call for help. At Rymers, we discovered that the sign marking the take-out point had been washed away in the flood. We worried that the young men might not recognize the gravel bar, so we crafted a homemade sign and attached it to some sticks near the shore. We drove up the hill, called their canoe outfitter and the injured man’s fiancée, and then drove back to the gravel bar, where the canoe had just arrived. Everything fell into place, as we took them to the emergency room at Mountain View, and simultaneously the folks from Two Rivers Canoe Rental came to gather their gear and collect them at the hospital. They were scheduled for a four-day float, with takeout at Two Rivers, so their trip was cut short. After a few stitches in his hand, he and his buddy headed back to Iowa. When we checked with him a few days later, all was well, and he was heading to Las Vegas to be married. As we pulled into Buck Hollow to transfer my kayak from her car to mine, a shuttle from Windy’s Canoe Rental drove by. “Maybe he’ll help us unload my kayak,” I joked. Before we could get out of the car, Randy Rose, a long-time employee at Windy’s, pulled up beside us and jumped out to give us a hand. The river gods were still smiling on us. Good river karma. Pass it on.